The whole world was shocked when the news came that the "King of Pop" Michael Jackson was dead. After months of his death, the final moments of his life was captured on video as he and his crew rehearsed for his supposed to be comeback concert tour. The movie is like a behind-the-scenes bundled in a DVD. But what surprised me was the performance of the man himself. Take note, this was a rehearsal, but you can see the guy sing and dance in a performance level. Heck what would be the outcome of the concert if it ever really took place? You'll see MJ here in his raw form. You'll find out how he even memorized even the single melody of his song and will detect even the slightest change in his music. 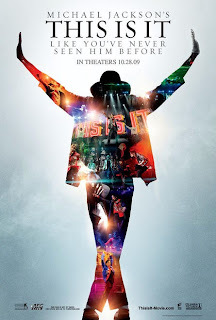 Truly, if you are a fan or not of Michael Jackson., watching This is it will surely entertain you. Every single fan got their heart broken about what happened. Especially those who bought tickets for his concert. I love MJ and I love "this is it"! Galing!